← Ron Clarke, Warnie and Thorpie’s big shoe! I recently ventured to Sydney and I’ve finally managed to get it on paper (or web technically speaking! )……It was a big race in terms of the pedigree lining up. 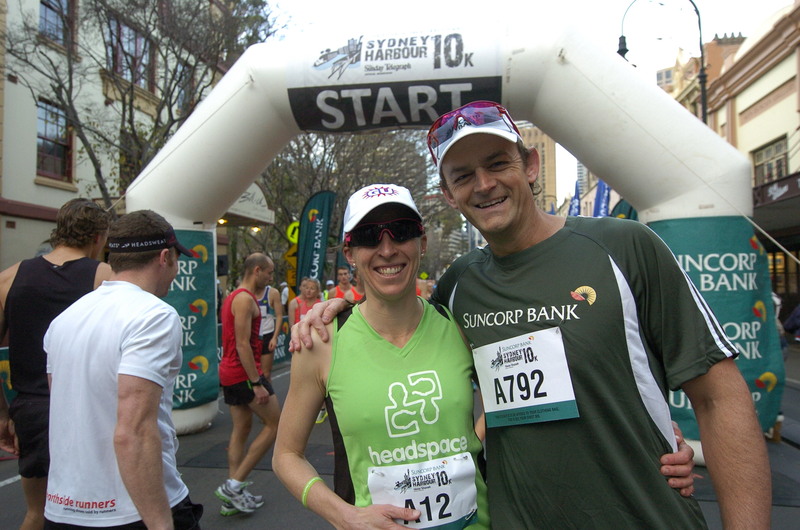 I would be in the company of 3 Olympians and Australian Representatives, taking on the Suncorp Bank Sydney Harbour 10km. Due to my late decision to race, I sought advice from Gregor, my coach, as how to take on the challenge of 3 races in 3 weekends! His advice was simple, don’t race all three! It would mean mediocre results to race all three, just focus on one. So the plan was: Gold Coast as a “tempo” run, then Sydney to be ‘an all out, go for broke race’ and Melbourne to be steady. The Sydney race attracted the big guns and as the media file went round on the email with everyone’s past results, I thought I’d scan through. Let’s just say I was a little freaked out, feeling that I was going to be just making up numbers! By no means do I talk myself down, but realistically in a 2nd year back to running, I calculated that I was a good 3 mins off the top female runners over 10km! I got through the Gold Coast, not feeling awesome, but I put that down to a night slept at a noisy backpacker and running 5km solid to the start line (to make it in time!!). I had a really good week of training and as a confidence racer, that helps. Arriving in Sydney, I had less than a dollar in my back account, talk about hungry to race and place! I knew top 10 would make get prize money, but ideally I wanted top 5. So how did I get this broke? Let’s just say , I am a spender on random things, bikes, old books, albums, vintage clothes (Op shops you will find me in absolute bliss!!). Add to which, most runners have product sponsors, no cash, hence why they hold down jobs while racing professionally. So Sydney on Saturday involved a light jog, a run technique session from a prize I gave out at Mini-Mos race, then media time. So pretty busy, but good distraction. I warmed up chatting with Marty Dent (off to the Olympics for Mens Marthon, go Marty!!) and felt pretty pumped. Gun goes and I am looking at 3 girls in front, holding just over 3min/km pace!! I went through close to 3:18, with Wes, I guy I coach by my side. I felt good, like I had found that sweet spot of hard but efficient, a good rhythm. I held position until 1 km to go. Just rounding under the Harbour Bridge and around some swanky hotel. I had the “deepest fears, powerful beyond measure” in my head to stay strong!! I got pipped for 4th position but looked up to my absolute delight.. I had run 35mins!!! That was a 90sec PB, I was super stroked. More positively, was the volume still needs a lot of work on. I was running on good track speed, now it’s time for some endurance. Lara Tamsett won, and in 2nd, Jess Trengrove. She is another Marathoner off to the Olympics (it will only be her 2nd marathon), she is looking and feeling strong at this stage of her preparation. The mens race was Marty Dent, leading the way from Liam Adams and Russ Dessaix Chin. Some great pics that wrap up one top weekend! I met Gilly, pre race and chatted after, top Aussie! Love when the finish line is in sight! 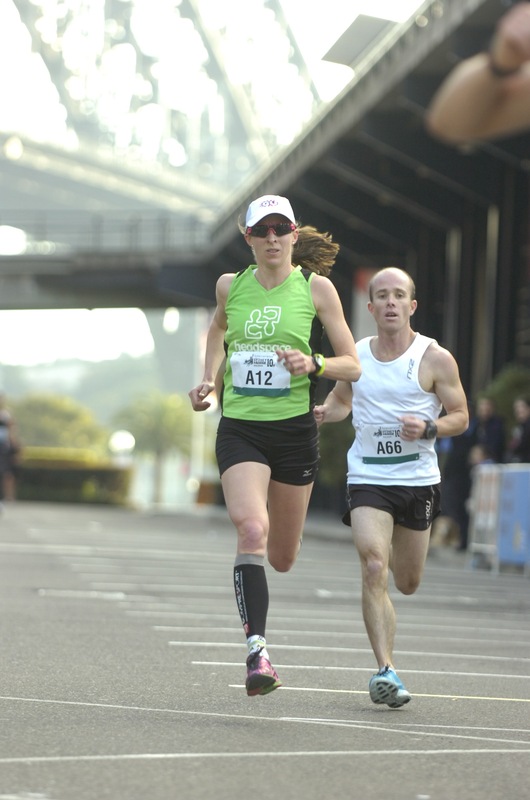 This entry was posted in Sports and tagged Jessica Trengrove, Lee Troop, Liam Adams, Martin Dent, Olympics, running, Sydney Harbour 10km. Bookmark the permalink.